Chesterfield boss Dean Saunders says he is happy with how his team have begun the season as he continues to build at the Proact Stadium. Saunders took over from Paul Cook in the summer and saw a cluster of key players leave the club. But having taken 14 points from their opening 11 games, Saunders believes things are progressing well in the circumstances. He said: “When you look at the players we lost, it’s £4 million worth of talent. You can’t replace people like Sam Clucas or Tendayi Darikwa, who are quality players and also versatile, with free transfers. 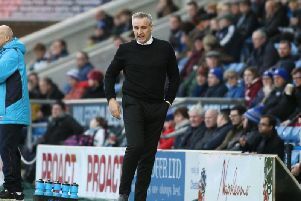 “We’ve missed people like that but I’ve just had to do the best I can to fill those gaps with the money we’ve got and also with the young players who are getting more and more games and improving all the time. Just six points separate Rochdale in the final play-off place from Doncaster in the relegation zone, meaning every win is vital in the jostle for positions. Saunders added: “You wouldn’t have envisaged the league being so tight, with the teams at the bottom having that many points. We’re three points off the play-offs but also three points off the relegation zone.